For more news about the Department of Religion and Classics, visit the University's Newscenter. Professor Gregory Heyworth and his digital media students are using different wavelengths of light to reveal illegible text that could create a sacred, tangible link with Jewish congregations lost to the Holocaust. Listening to the news, it can feel as though acts of violence—particularly violence inspired by bigotry and hate—are on the rise, and unfortunately the numbers back that up. How are we to make sense of this rise? Three Rochester researchers sat down for an academic conversation about hate and intolerance, discussing reactions to recent incidents of hate, important lessons from history, and the psychology of stereotypes and intolerance. Spring forward. Fall back. On two Sundays each year, as we move in and out of Daylight Saving Time, time itself suddenly starts to seem a little arbitrary. Every discipline in the University has its own way of constructing and thinking about time. Whose heritage do we honor when building—and destroying—monuments? What’s the function of a monument? Who should be honored with one—and who gets to decide? Richard Leventhal, a professor of anthropology at the University of Pennsylvania, will explore these questions in the second annual James Conlon Memorial Lecture. Students, faculty, and alumni take their unique perspectives on difficult and controversial conversations into the community as part of the annual arts fest. Rochester will host the U.S. premiere of God Has No Country, a one-man play written and performed by Donal Courtney. The drama tells the story of Monsignor Hugh O’Flaherty, who used his Vatican connections to harbor Jews, ultimately saving more than 6,500 lives. When you head home for winter break, what are you hungry for? Dani Douglas ’17 poses the question to four of her classmates, and provides links to recipes for these home-made favorites. 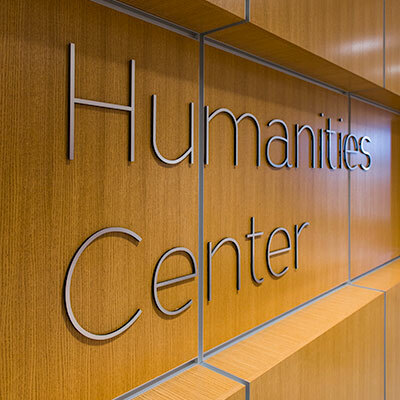 The recently created Humanities Center supports multidisciplinary engagement around literature, history, the arts, and philosophies of cultures past and present with the aim of fostering educated, contributing global citizens.